Here’s a friendship bracelet video tutorial that also shows how to make my favorite type of color pattern for a square braid: chevrons across bicolor stripes. 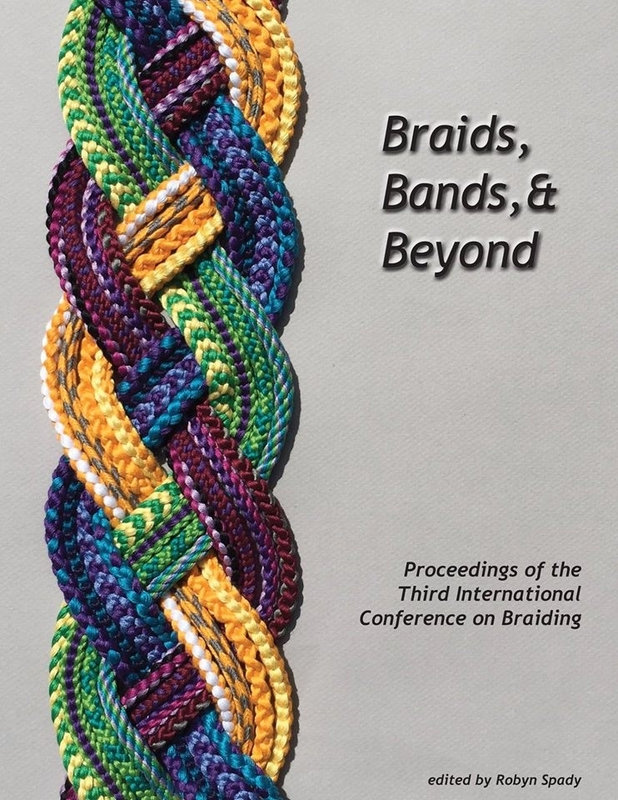 The videos don’t teach how to braid fingerloop braids—they’re for learning a particular color pattern, the loop start, the closure, and a trick for changing the bicolor pattern. For learning how to braid, see my START HERE (5 loops) and CONTINUE HERE (7 loops) tutorials—they have plenty of slo-mo and explain all the moves, including how to make a flat version of these square braids. 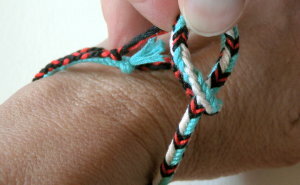 If you are a kumihimo braider, you might like fingerloop braiding. It’s the technique that kumihimo came from, and is a lot faster to do, especially for lengths that are shorter than your arm-span. After poking the ends through the hole, tighten up the loop closure. Tighten the noose/loop by pulling below it. Loosen the loop (for removing) by pulling on the the other end—the end(s) you stuck through the hole. In the first bracelet video I suggested using 29″ lengths of yarn, in the second I said 32″. (This is twice as long as the loops will be.) 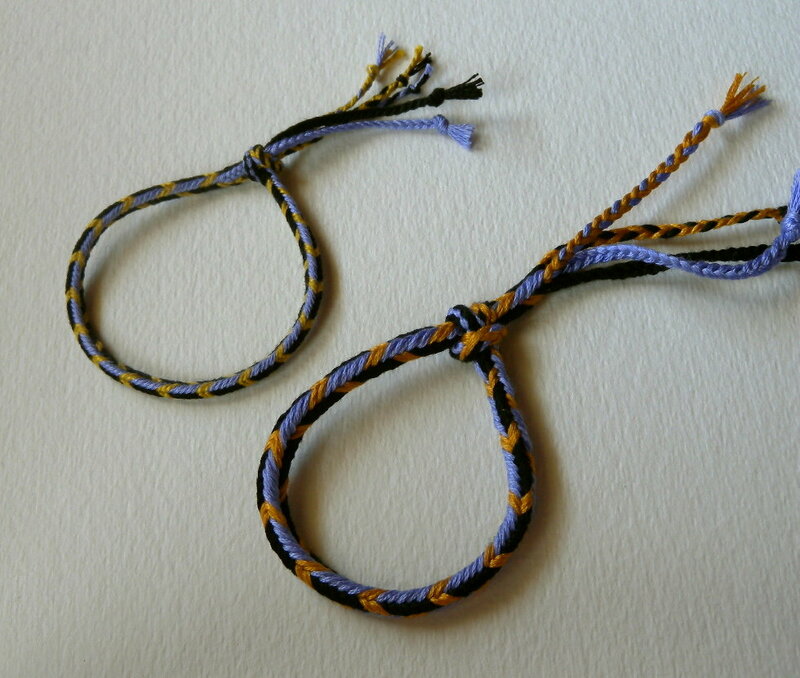 These both ended up a little short for an average woman’s wrist, if you want to leave room for tying-on. 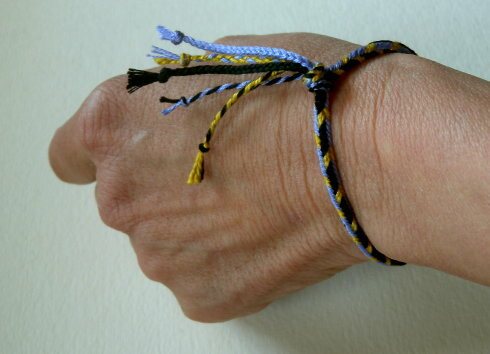 My wrist is only 5.5″ (14cm) around, and the first bracelet was barely long enough. Try 35″ to be safe, better to have a little extra length than not enough. Length needed varies depending on wrist size, thickness of the thread, and how loosely or tightly you braid. Yarn shortens up as you braid (“take-up”). And you can’t braid to the very ends of the loops—you need a few extra inches for the ends. The two bracelets above were both made with 7 loops of embroidery floss. The larger one was made with doubled strands of floss, which made it about as thick as my other sample bracelets—all the other bracelets in these photos were made with sport weight, mercerized cotton yarn (elann.com Lara, Millefile fine, and others). C — The last video is a bonus bracelet tutorial showing a different chevron pattern—the purple/black/gold one in the photos above—plus how to make a no-ends loop start with an odd number of bicolor loops, using doubled strands for the loops. This is a fussy way to start, so the first part of the video is long and boring! If you just want to learn the color-setup but not the no-ends start, skip to near the end of the video to see the color set-up for the main part of the braid. 0:14 View of the upper divided-braid section (already braided). 4:13 A look at the emerging braid pattern. Possible pattern variations. 6:18 Accidental dropping of loop bundle, recovery and error-check. 8:38 Making sure that the bicolor loops are in the correct orientation. 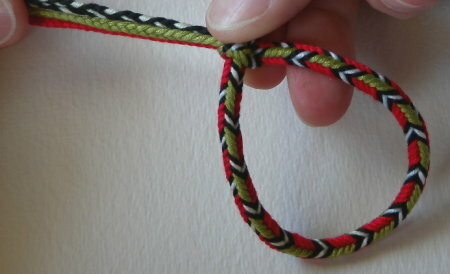 12:37 How to make the green and red sides switch places in the braid. 16:37 View of the braid with the green and red sides switched. 3:05 Loop set-up: 4 bicolor and 3 single-color loops. 6:40 Linking left & right loops for ‘Handshake’ start. 9:13 Setting up for braiding the left bunch of loops. 10:48 Making a 4-loop braid with the “Edge” pattern to form the left side of what will be the loop at the top of the bracelet. 16:00 Joining up both sets of loops for starting the main part of the braid. 18:54 Halfway thru 1st repeat, “fussy-tighten” to join the bottom of the loop cleanly. 22:30 View of the braid, and pulling out the header cord. An ending tassel of four minibraids that only require two quick braiding procedures! Shows how to use a loop in one end of a braid as an adjustable closure. Different chevron pattern, with 5 bicolor loops and 2 single-color contrast loops. Shows how to use doubled strands to form your loops, so that even the one odd bicolor loop (the 5th one) will not leave any loose ends hanging out at the top of the braid. If you just want to learn the color-setup but not the no-ends start, skip to near the end of the video (24:15) to see the color set-up for the main part of the braid. 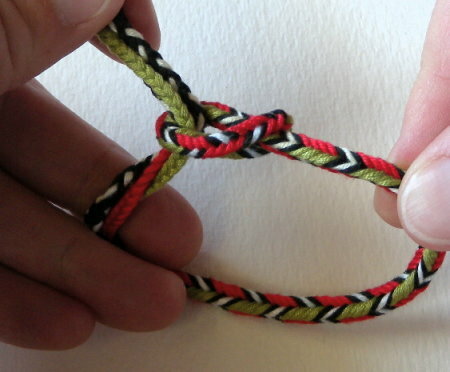 1:28 Problem of having an odd # of bicolor loops for the no-ends start–will usually leave 2 ends at top of the braid. 3:48 Using double-thick strands of embroidery floss to avoid this problem. 6:45 How to make the one “odd” single-length bicolor loop so that it will only have loose ends at one end (the fingertip-end of the loop). 3:16 Linking the left set of loops with the right set of loops. 15:22 The “no header-cord” method of suspending the loops to braid the 2 halves of the starting loop. 17:35 Ready to braid the left half (a 4-loop square braid). 19:04 Laying aside the finished left half of the loop, preparing to braid the right half—(a 3-loop square braid)—again with no header cord. 24:15 2 halves of the loop now done, here getting ready to join them in braiding the main part of the braid. 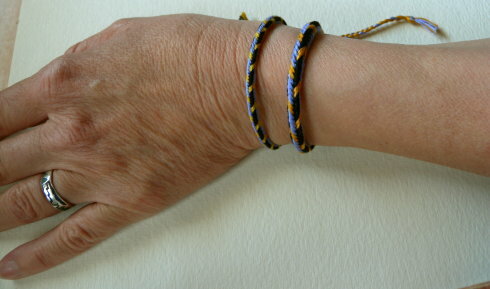 Color arrangement on the fingers for the main braid’s pattern: bicolor loops on the two hands should have the opposite colors in upper position on the fingers. 25:57 Halfway thru first pattern repeat, loops have switched hands—time to tighten well to ‘set’ the starting loop firmly onto the main braid. Fussy tighten at this point. 27:14 Noticing that I braided the 3-loop side of the top loop a little longer than the 4-loop side…This is why 3 of the loops in my braid ended up being slightly shorter than the other 4 loops! Not too bad here, but wouldn’t want them any shorter. Try to aim for both sides of the loop-start being equal in length. If you notice any errors or have any questions/ suggestions/ comments, please leave a note below. Or just leave a note to say hi—I would love to hear from you! 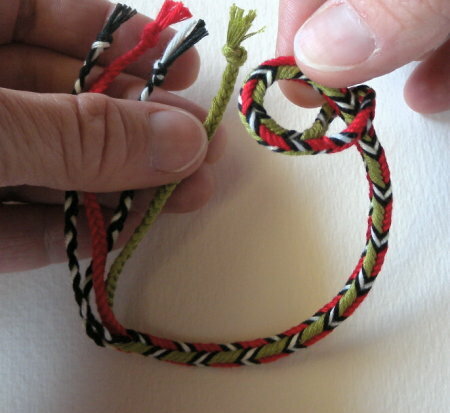 With 5 loops, the handshake loop start at the top of the bracelet would be a three-loop braid on one side of the loop, and a 2-loop braid on the other side (see the bottom of my Tutorials page for links to video tutorials for the 2-loop braid). 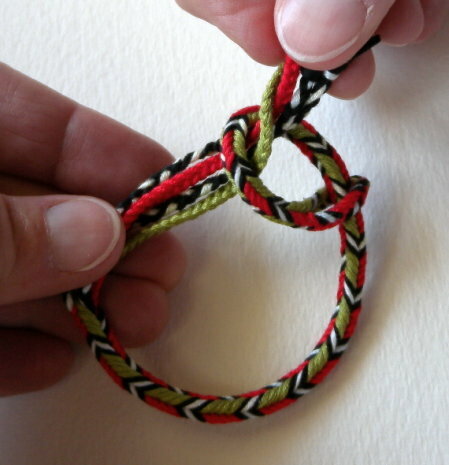 To finish a five-loop bracelet, you can’t divide it into four mini-braids at the end, only three: one divided 3-loop braid (= 2 little braids), and one 2-loop braid (2-loop braids can’t be made divided). **This video shows how to braid one particular square braid color pattern. Many other square braid color patterns are described in my bicolor loops tutorial, the color-pattern planning tutorial, and my recent post “More square braid color set-ups“. See full copyright restrictions and permissions at the bottom of the sidebar (if you are using a smaller device, the ‘sidebar’ may appear somewhere other than on the side).